Note: This topic is to talk about Day 19 of the Advent of Code. Here is my solution for Day 19. I did not even attempt to make a solution that would solve part 2 for any input (in a reasonable time). Instead, I looked at the trace of the execution of my input and found the inner loop. I then wrote an optimized version of the inner loop. 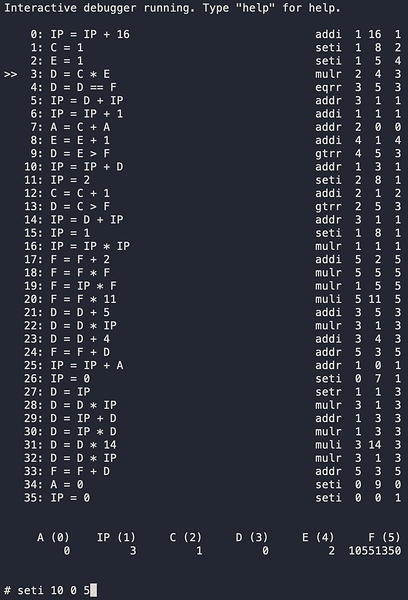 To run the optimized version, I implemented a general mechanism for installing a breakpoint handler and installed my optimized inner loop as a breakpoint handler. The breakpoint handler will only be installed for code similar to my input program (it must be the same instructions, but it registers could be different). My solution runs in less than 20 seconds. This idea with installing the optimized loop is very interesting. The complete solution is here, and it takes about 6 sec combined for both parts. I got stuck but after reading your replies I tried to also optimize the loop and I arrived to the same conclusion as @sasajuric: part 2 is basically computing the sum of all divisors for a given number, with some busy wait thrown in for good measure, haha. # Specialized instruction for part 2. # The problem is basically computing the sum of all numbers in register 3. Both parts finish in 0.6 seconds. This is by far the puzzle that took me the longest. I actually wrote a decompiler/debugger in Elixir to poke with the program. It was sooo much fun! With the tool at hand, after a few initial steps in which the program initializes the register 5 with a big number, I could run “seti 10 0 5” while the program was running. 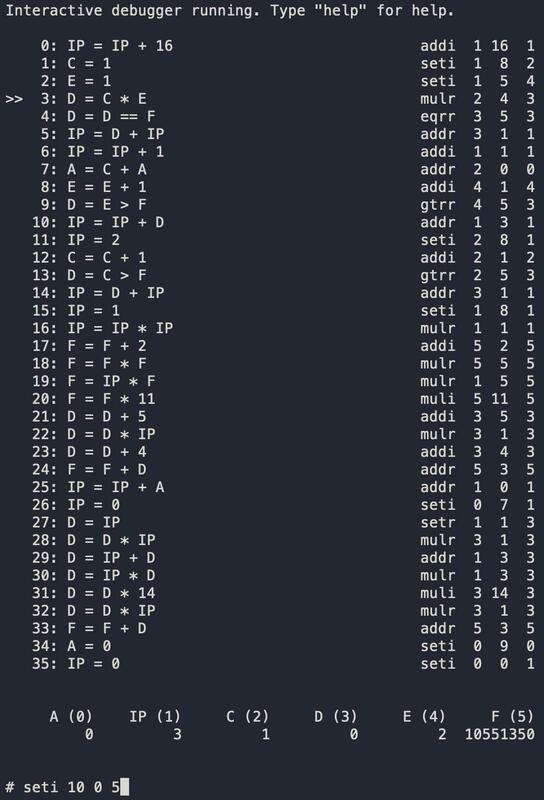 After that it was quite easy to trace what the program is computing.